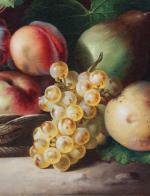 Biedermeier still life with fruits was executed in 1857 by still life painter Francesco Malacrea. Born in Trieste in 1813, where he died in 1886. His family was from the Friuli area. He was eccentric in both his behaviour and his dress. He often painted several pictures, one next to the other, on belts of the same canvas and then sold them on the streets, simply cutting off whatever the customers wanted. He depicted flowers, vegetables, fruit, game and fish. 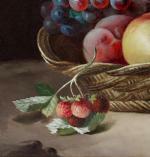 Five of his works are in the collection of the Civico Museo Revoltella in Trieste, beside the exhibited picture the Narodna galerija also holds Still Life with Fruit and a Small Basket, Inv. No. 3024. Dead Birds and Victuals are kept in Strmol castle near Kranj. Inscription: signed and dated 1857 lower right. Technique: oil on canvas. Original period gold-plated frame.